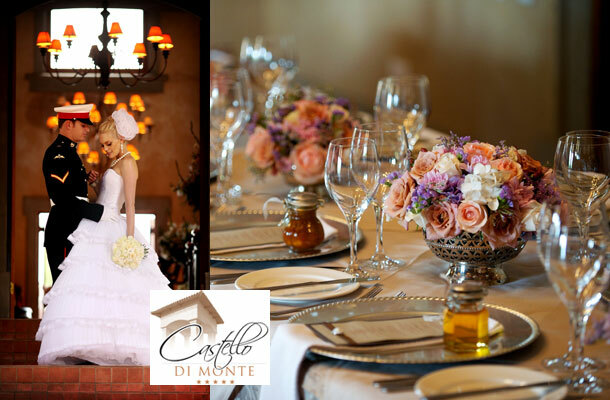 Enjoy elegance, tranquility and grace – if luxury is in the detail, Castello Di Monte flies on the wings of excellence. We can cater for up to 30 people for a wedding. Your special, small intimate wedding (exclusive use of villa optional with only 20 guests maximum) will be a truly unforgettable experience. The landscaped garden with terraces and running water troughs lends itself to a visual feast – the perfect backdrop for a perfect occasion. The formal lounge with its high fire place, dark wooden bookcase and works of art welcome you inside. Enter the main dining room with painted ceiling reminiscent of the Sistine chapel and pause for a while with family or friends to enjoy the fine cuisine, lovingly prepared by our resident chef who aims to delight the palate with his creations. For a special occasion, enjoy a unique dining experience on the panoramic deck on the top floor of the Villa as you take in the 360° view of panoramic Pretoria. Castello Di Monte is a place like no other and offers a truly unforgettable experience to all who enter its gates. To book your wedding at this 5-star graded venue telephone the team on +27 (0)12 346-6984. Alternatively for further details or to send an enquiry visit Castello di Monte.